Coding region for cellulose binding domain. When fused to a protein, protein attaches to cellulose. For analyses a GFP-fusion protein was designed. Therefore, Expa4 was cloned in frame with GFP and the cellulose binding domain. This coding sequence was cloned into a vector backbone and was used for plant transformation. The GFP signal was detected via confocal microscopy in plant cells. In large eucaryotic cells it’s possible to analyze the subcellular localization with fusion proteins. 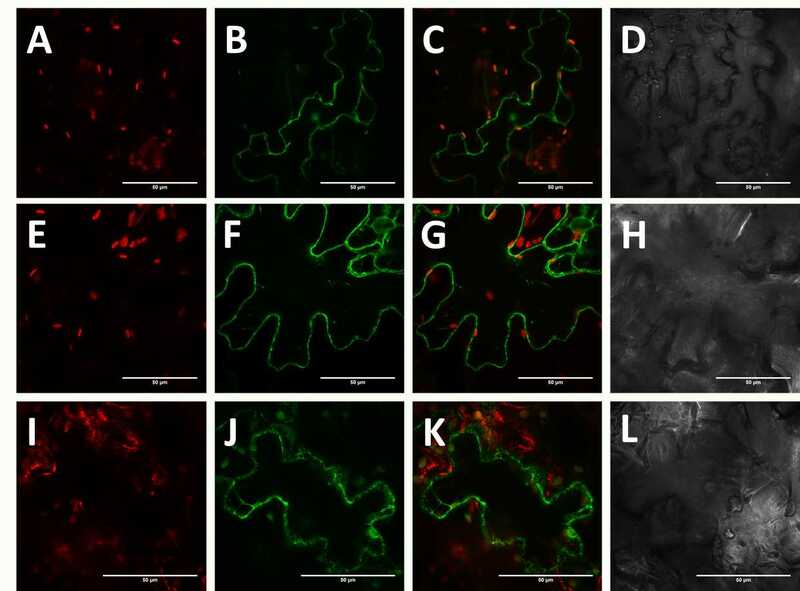 Figure 1 shows detected fluorescence of transformed Nicotiana tabacum cells. A GFP control without protein fusion is shown in lane A-D. The signal is specific for a cytosolic protein, which is indicated by chloroplast surrounded with GFP-Signal. In contrast the plasmamembranemarker (E-H) shows a specific signal at the periphery. The signal doesn’t surround the chloroplast, which shows that it is located at the cell cover. Because it’s a marker, it’s location is already known. The analyzed construct is shown in I-K. It contrast to cytoplasmic GFP, the signal appears to be in the exterior. The signal appears to diffuse between the cells, at the cell wall. This indicates that the secretion signal and the tethering at the cell wall via CBD might work. Fig. 1: Confocal detection of fluorescence from transformed plant cells (replicate 1). Transformed cells of Nicotiana tabacum were analyzed via confocal microscopy. Column A-I: Red channel, shows chlorophyll’s autofluorescence which shows the chloroplasts. Column B-J: Green channel showing GFP. Column C-K: Red and green channel merged. Column D-L: Pseudo transmission detection. Lane A-D shows a transformed cell with raw GFP. Lane E-H shows a plasmamembranemarker (Nelson et al. 2007). Lane I-L shows the detection of the analyzed construct: Expa4-GFP-CBD.